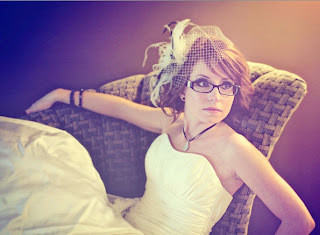 But the brief idea of having that as my veil faded as soon as I realized the hat was off white (my dress is white). Now despite that, I got to wondering if I could find such a veil for cheap or even make my own. At this point the sugar plum fairies started working over time in my head. My dress could possibly work with such a veil and it would allow all the beaded splendor of my gown to show. Sadly, I had forgot that my mother bought me a veil the day I tried on dresses. And it too was a bit of a beaded beauty... I might be able to trim it down a bit in size so it does not hang down far on the dress. But determining if that is possible will have to wait until I get over to my grandmother's house again as the veil and dress are stowed away in her cedar lined closet (we lack closets in our tiny mill row house so it was a risk to keep the dress with us). Oh the drama of wedding hair attire... The worst part is that I haven't even started to look at hairstyles yet. =( I wonder if most brides run right out and get a veil with their dress to only find they might want something different a couple months down the road?